In 2015-2016, the Kon-Tiki2 Expedition sailed two balsa rafts from South America to Easter Island, and halfway back. Documenting climate change, marine life, plastics, pollution, guara board navigation, and Pacific sunsets along the way. On March 1, 2017, the State Darwin Museum of Moscow hosted a much-awaited public appearance of Kon-Tiki2 crew – almost a year after the expedition's abrupt termination. Torgeir Sæverud Higraff, Boris Romanov, Andrey Chesnokov, Håkon Wium Lie, Pål Børresen and Evegny Schtil spoke to the public. 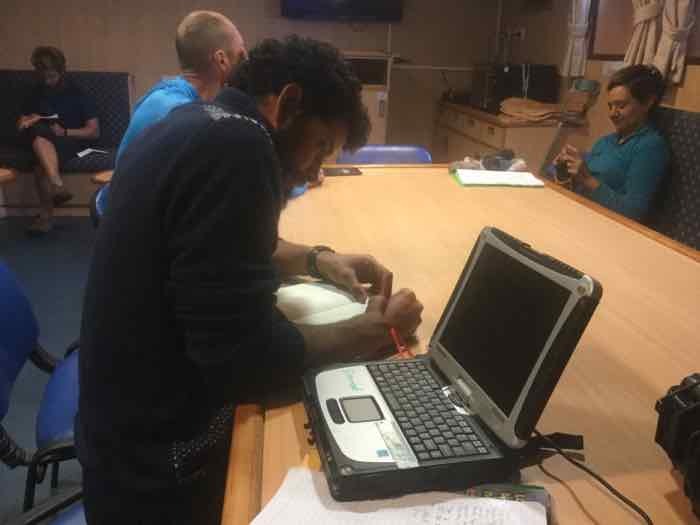 In spite of our real-time virtual presence aboard the rafts throughout the journey, what we saw and heard on Wednesday were some other pictures and a very much different view of the causes and consequences, along with some new emotion too. 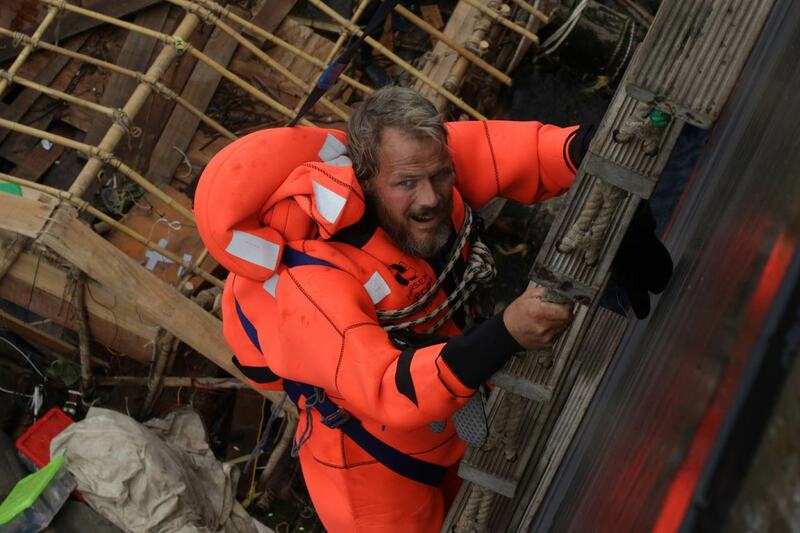 Torgeir spoke in much detail of his previous expedition – the Tangaroa – comparing it to Kon-Tiki2. «2006: I am in paradise and my dreams come true; 2016: a totally different picture». A different route (the leg from South America was completed and the return leg was not), a different raft design (Tangaroa rafts could have spent a year at sea), and, according to Torgeir, substantial deterioration in Ocean condition over the past ten years – in terms of the climate, the weather, plants and animals, etc.. He did emphasize the miscroplastic issue repeatedly, begging us to pay special attention, as otherwise «we would soon be finding pieces of plastic on our dinner plates». Speaking specifically of Kon-Tiki2, Torgeir focused on people, the team, and everyone's special role. There's still some sort of rivalry between the female and male rafts, and Torgeir mentioned Rahiti's military camp discipline as opposed to Tupac's immensely fun and somewhat «couldn't care less» setup. It's amazing how Torgeir seems to be still there, to keep sailing and living through the highs and lows of the mission, to keep loving every moment of it and mourning the expedition's ostensibly premature and abrupt ending. I didn't even dare to ask him whether he thinks this was a proof that sailing from Rapa Nui to South America is impossible, or just a misfortune. He kept saying «I was so happy» and «this has been a nightmare» or «these were the best days ever». He said that dismantling the rafts before evacuation was the toughest task ever: «in a male world, this is the closest one gets to abortion». (Which means the goal of reaching South America was the «baby», not the journey itself! Honestly, I could not disagree more! To us, the very fact that the mission happened has been way more important that the actual proof of the Polynesian genome hypothesis). Torgeir is definitely a charismatic speaker, a born leader, and a highly handsome human being. I wanted to yell out «Hey, man, quit being upset, let's do another one!», but nobody dared to translate this for me :) But people still kept asking him about Kon-Tiki3, 4, 5 etc. He replied that his next mission will be on Chukotka (!) and asked for some phone numbers. As to Kon-Tiki3, his wife is likely to have some objections (which is understandable keeping Chukotka in mind). Other crew members looked way more relaxed and calm. Torgeir's emotional and rapid slide show was followed by Evgeny Schtil's short film (or rather a collage) dissecting the expedition – with both cute details (like 200 books aboard the two rafts and 2 sweaters knitted by Signe) and some heart-breaking facts of evacuation and weight loss. Evgeny believes they needed more wine, condensed milk, meat preserves, and lard on board. On the other hand, he was pleasantly surprised by freshly baked bread and buns instead of the usual dry crackers. By the way, Evgeny did quite a few drawings, and Torgeir said that the mission needed such an artistic person aboard. The audience has been a pleasure to watch, with many faces being familiar – from the Russian Kon-Tiki2 fan page on Facebook and elsewhere. The discussion part turned out to be a bit short – we definitely needed more time to debate the rumors and versions of what happened. The audience was well-prepared, so it could have been quite an argument. But Torgeir was wearing a suit! Our numerous kids made the whole thing less formal by both roaming around the conference hall and asking questions like «is he speaking English for a reason?», «what did you do when you were drowning?», «why didn't you have a phone?», etc. 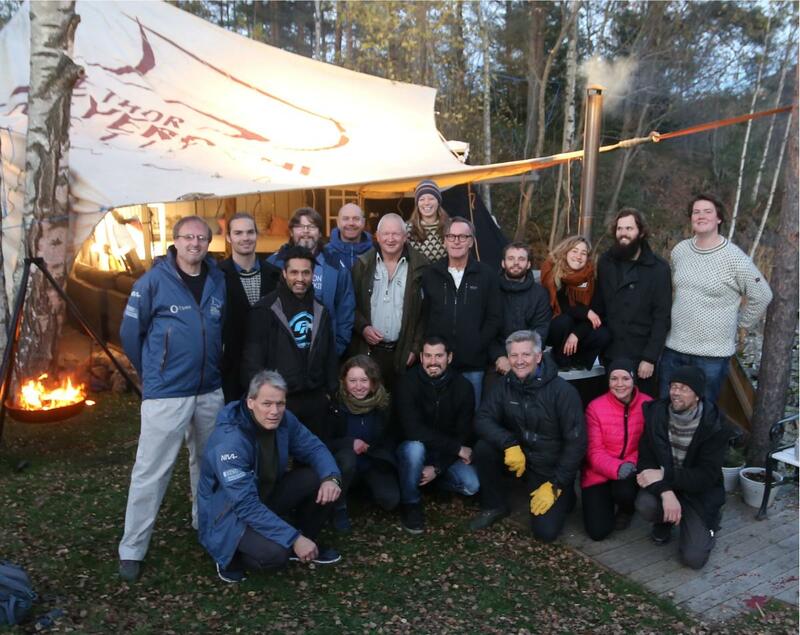 After the event the Norwegians took a picture with the bunch naming it «The Crew of Kon-Tiki15». That would certainly be fun. Poet Elena Albul has asked a very deep question, something like: «the ones new to ocean voyages are all speaking of something new they discovered about themselves during the journey. But what is the romantic/transformative appeal of the mission for such an experienced explorer as Torgeir?» The matter was lost in translation, so Torgeir replied with delay and to a question never asked, or maybe the tough Norwegians couldn't care less about some stupid romantic appeal. That's what he said [in jest, editor's comment]: «I enjoy having people as slaves». Håkon managed technical support. Pål did human resources. Andrey performed routine operations on the raft. Boris and Sergey were mission doctors. Everyone had a job and I needed them all as professionals. As to me, I just love being at sea, this is my life». While Kon-Tiki2 was at sea, Ole Bjørndalen won yet another gold medal, so we asked Torgeir via Andrey «What's your Norwegian secret?». He replied: «There's no secret. All he has in life are his skis and his rifle. He just keeps skiing and shooting all the time». Well, Torgeir, as I see him, just keeps sailing. We wish him all the luck right where he belongs – between the Ocean and the Skies! And he can always count on Russians for romantic appeal, deep meanings, and medical assistance. (2016-05-25) Hege Araldsen, Norway's Ambassador to Chile, has sent a greeting to the Expedition. 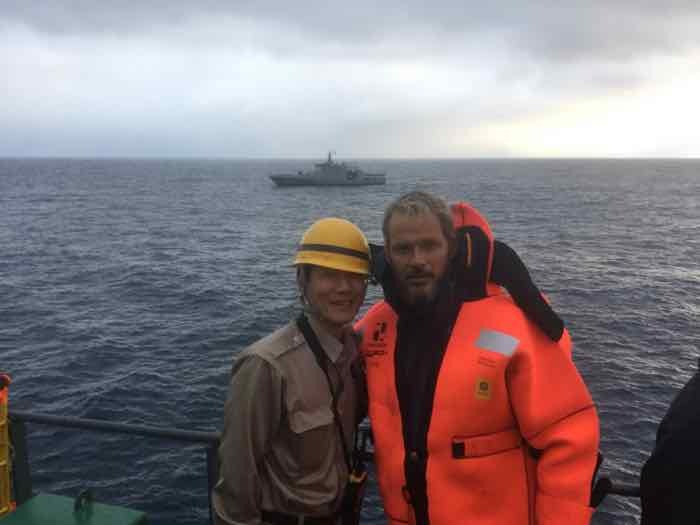 As can be seen in these pictures, she recently met with Admiral Larrañaga to express gratitude to the Chilean Navy for the rescue operation. Read her and other greetings on our greetings page. (2016-05-20) I need to drive 1500km from Oslo to Rotterdam to pick up the Kon-Tiki2 equipment that just arrived from Chile & be back in 3 days. Which one of my friends is stupid enough to want to help? I know, I'll call Ian! And so the adventure began. At least according to my friend Ian Naysmith. Actually the plan was made a couple of months ago. During the rescue operation in the Pacific ocean in March, some important equipment and data were saved, weighting half a ton. We have ships sailing from here to Holland, we may place the equipment on one of those ships , said Eugenio Moreno, general manager of Gearbulk in Chile. He got Phil Curran, who is head of Gearbulks operation group in Chile, on the job. 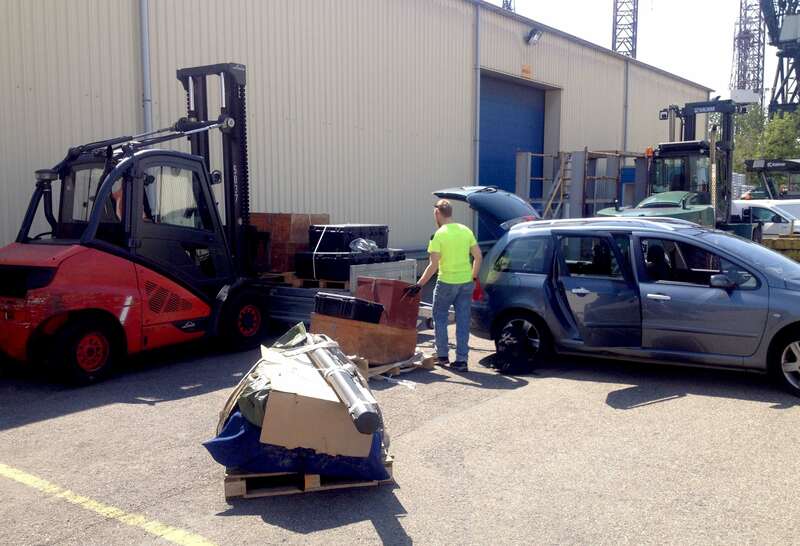 When the ship arrived in Rotterdam, Orestis Bakas from Gearbulks UK office took charge. 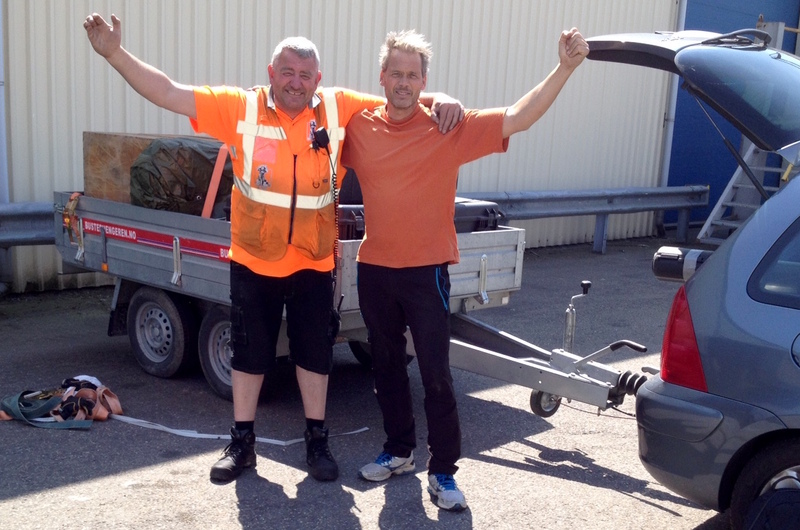 Ian and I only had to drive a car and a trailer that I was happy to borrow in Oslo. Outside of the driving and occasional traffic, all went great. Steven Csanyi from Australia delivered the goods at the port with a big, helpful smile. 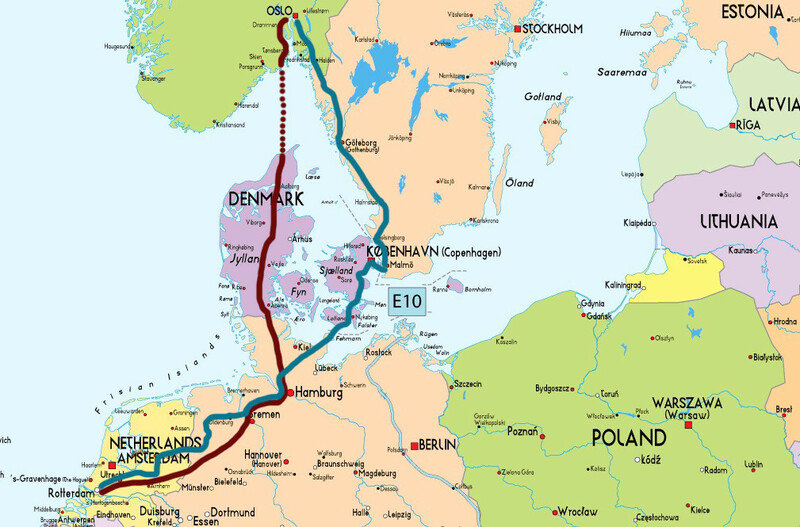 On the map you can see the return route (blue line). The border crossings went okey. 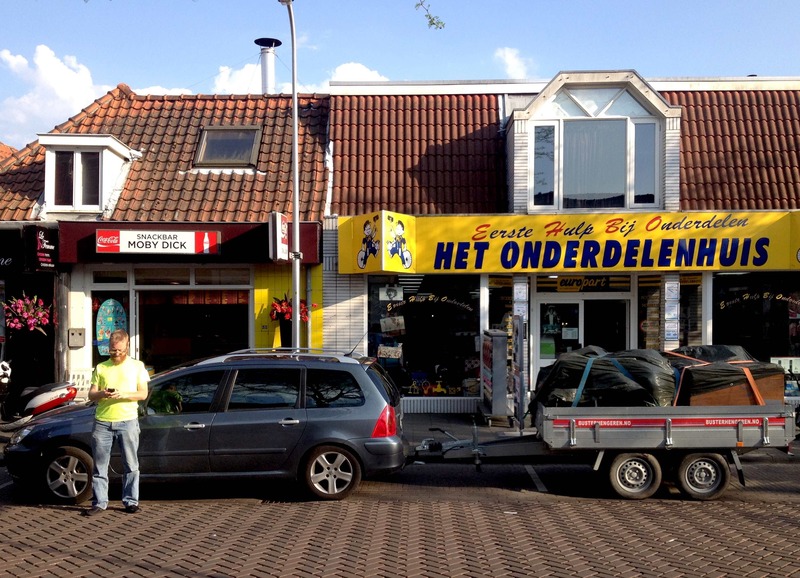 Fortunately we did not need to explain that the stuff in the trailer was from South America, picked up at a port in Rotterdam. We stayed one night in Osnabrück on the way south, and in Oldenburg driving north. 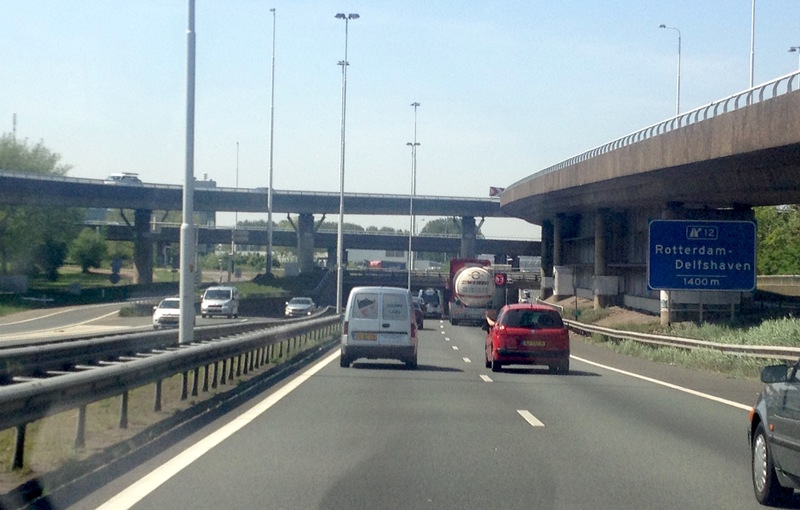 Both pleasant towns. But driving 3000km in three days is not something I recommend as vacation. I think Ian agrees. First of all my congratulations! For the first time you showed that it is possible to sail by a copy of an ancient Native American raft from South America directly to Easter Island. This in itself is a great achievement. In addition it gives further support to contacts between Eastern Polynesia and South America in pre-historic time. You can read the full greeting, and greetings from Nadia Artemieva and P J Capelotti on the Kon-Tiki2 Greetings page. (2016-03-25) Several Kon-Tiki2 crew members, including Expedition leader Torgeir Higraff, landed in Oslo today, to a hero's welcome. Family and friends had gathered at the airport to greet the crew. 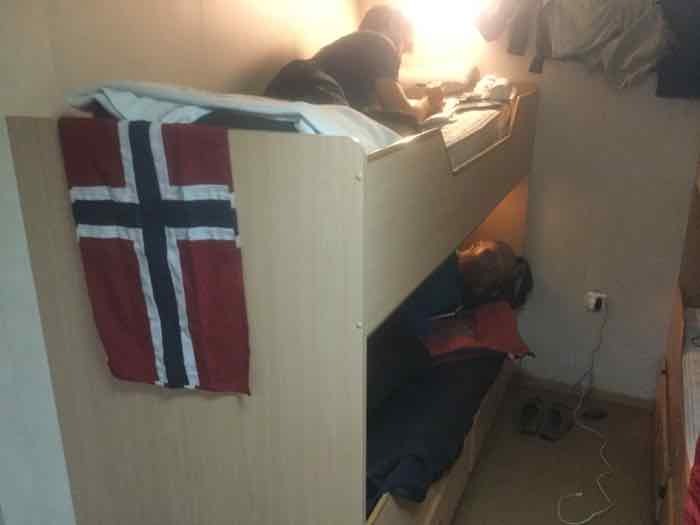 In Norwegian tradition, flags were used to cheer the returning sailors, who were happy to be home after an extraordinary journey. In these pictures you can see Ola, Erik, Erlend in addition to Torgeir. 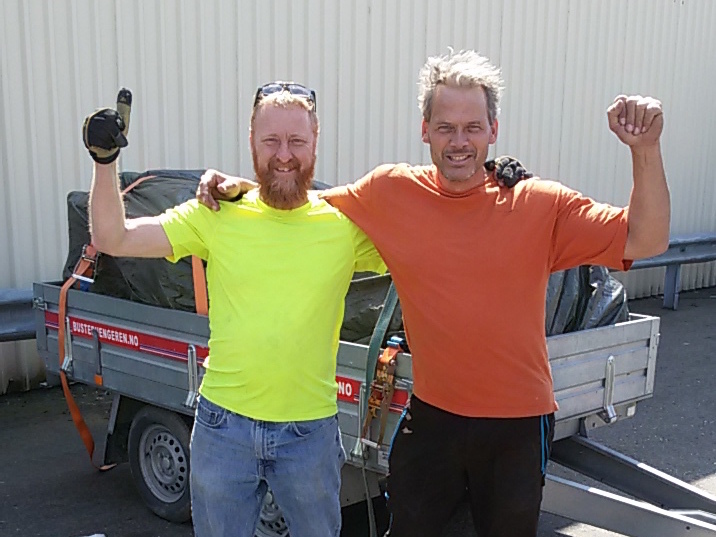 Also, Håkon and Øyvin, crew members from the first leg, were present, and can be spotted. Andrey, the Russian crew member on Tupac, did not arrive in Oslo, but he has written some closing remarks, well worth reading. (2016-03-21) The Chilean Navy ship "Piloto Pardo" today entered the port of Talcahuano, near Conception, in Chile. All Kon-Tiki2 crew members are on board. 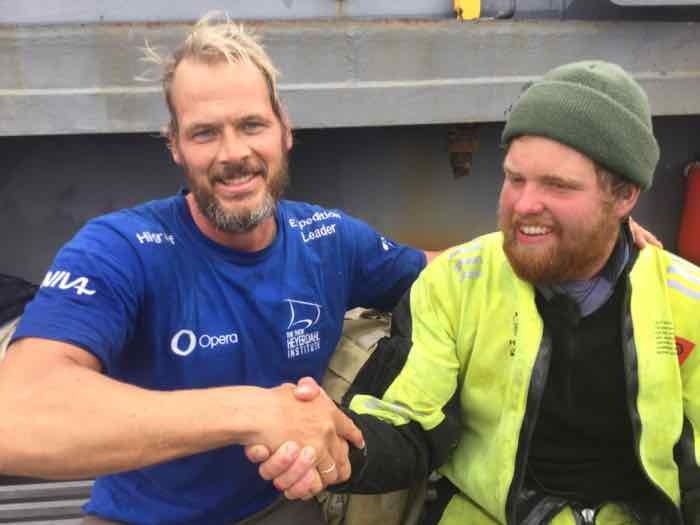 While still at sea, but with cellphone connectivity, Expedition leader Torgeir Higraff expressed heartfelt sadness for not arriving by raft, as he has been planning for years. However, he also expressed gratitude for everyone being safe thanks to the Chilean Navy and the Hokietsu Ushaka freight ship. In the hours to come, the crew will transfer to a local hotel and have debriefing sessions. And probably a good meal, prepared on land, for the first time in 74 days. 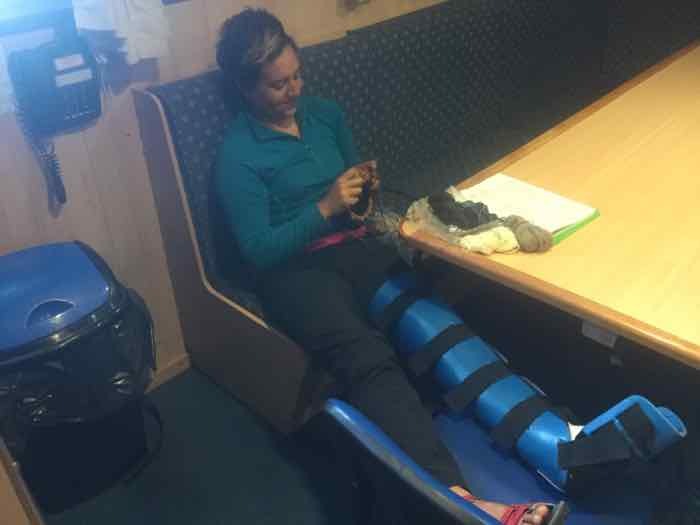 (2016-03-20) Lisa, one of the Kon-Tiki2 crew members, was injured when being evacuated from the Rahiti Tane raft. 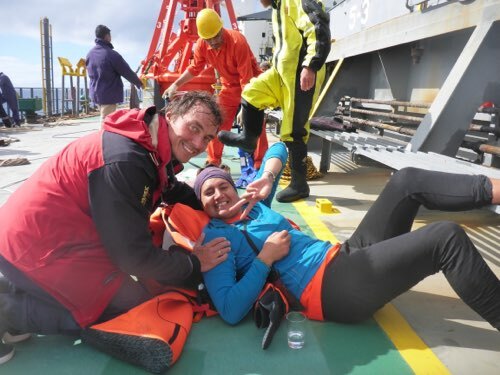 Read Liv's description of what happened and how Lisa continued the climb to the deck of Hokuetsu Ushaka. 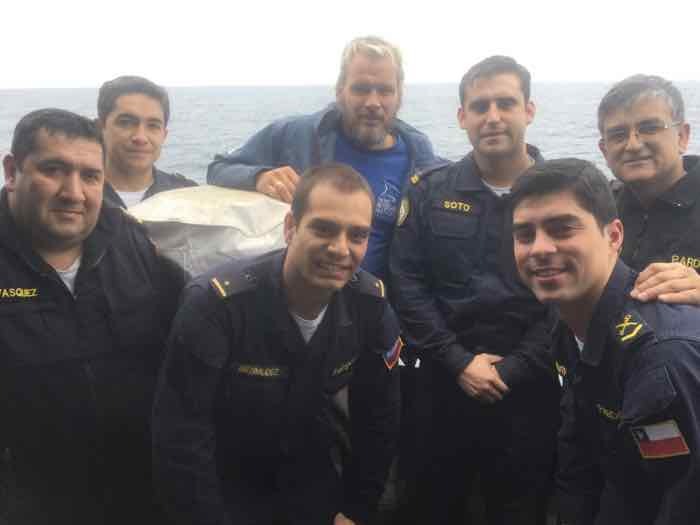 (2016-03-19) After two days on the cargo ship, the Kon-Tiki crew and the scientific equipment from Tupac are now with the crew of 43 people on the coast guard ship Pilot Pardo. 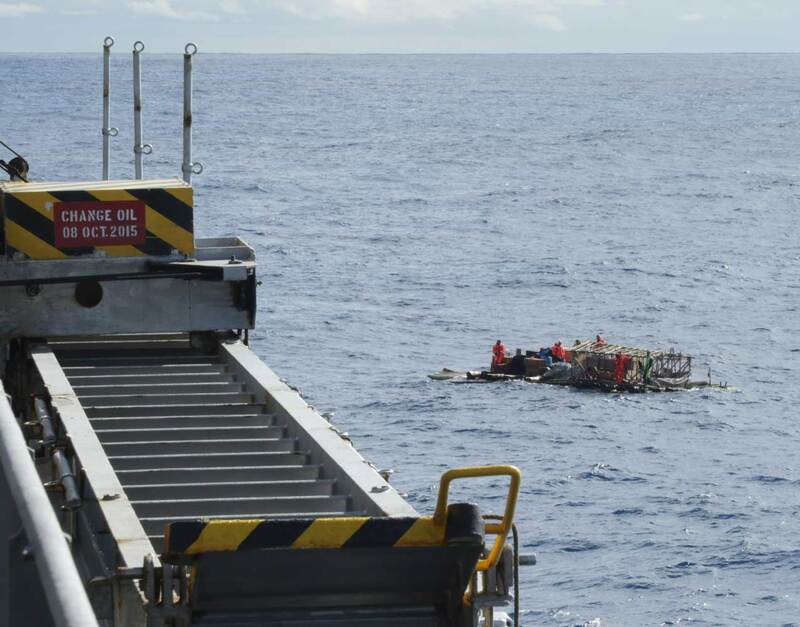 We have been rescued twice this week and I think my fellow Kon-Tiki2 crew members share my opinion that both rescue operations were perfectly executed. My gratitude goes firstly to Captain Yun Sun Gug from South Korea who made us feel as home in Hokietsu Ushaka. He was rescued himself in the Indian Ocean 41 years ago when his ship sank early in his career. I know what it is like, I understand how you feel , the veteran told us in a moving speech yesterday. In those days we did not have communication like now, we only had morse. My wife and daughter suffered a lot for 20 days before they got to know that I was okey . In comparison we talk with our family with our tablets, thanks to our Opera Software sponsorship. I will never forget Yun and his crew. In Pilot Pardo we had chicken for lunch and were served wine. Now we rest in good beds and enjoy Chilean professional rescue standards. These men really know what they are doing. It took only a few minutes to bring us into the RIB boat and from this we were lifted up in the air and to the stairs that lead us onboard the 80 meter long ship. Talcahuano is their home port, some 450km south of Santiago. We'll be there Monday at 10am. 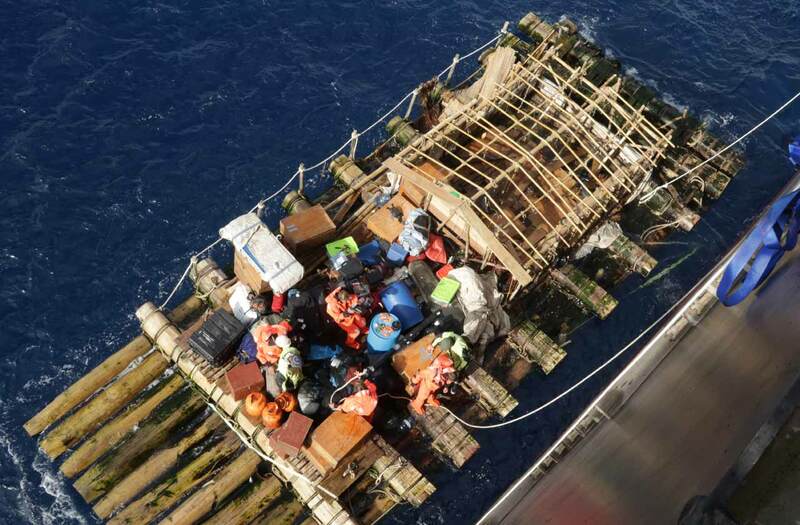 (2016-03-19) The 14 crew members of the Kon-Tiki2 rafts are now safe and healthy on board the cargo vessel Hokietsu Ushaka after a successful rescue operation Thursday. We decided to ask The Chilean Armada for assistance and to end the scientific expedition Kon-Tiki2 after 115 days of sailing and 4&half; months at sea. The two rafts – Tupac Yupanqui and Rahiti Tane – were made of 11 balsa logs and 10 crossbeams held together by 2000 meters of natural fiber ropes – like the ancient South American rafts. Tens of thousands of waves, up to six meter heght, hit the rafts in an extreme El Niño year. This constant stress for 16 weeks weakened the ropes. Some of the 150 or so knots were replaced in tough working conditions, but we could not replace all of them. In particular, the rigging was a major safety concern. To avoid accidents (e.g., a mast collapse in a storm) we decided to perform a controlled disembarking during daylight in good weather. We are very happy with the help from the Armada. In October last year, a month before the launch of the rafts, I met representatives of the Aramade in their headquarters in Valparaiso. On Easter Isladn, the Armada assisted us in mooring the rafts, and during the voyage we have had weekly contact with the Armada. Kon-Tiki2 is a unique collaboration. Logs from Ecuador provided by the AirexBaltekBanova comany were turned into rafts in Peru at the shipyard of the The Peruvian Navy, then sailed to Easter Island, and finally rescued by The Chilean Armada in an attempt to reach South America. (2016-03-19) When our call for assistance was sent out, the Maritime Rescue Coordination Center contacted the closest ship that could come to help. As we were in an area with little ship traffic we were mentally prepared that we could have to wait for several days. However we were lucky that the woodchip cargo vessel Hokuetsu Ushaka under the command of captain Sun Gug Yun was only twenty hours away from Rahiti Tane, on their way from Japan to Calbuco in Chile. After successfully saving the crew of Rahiti Tane, Hokuetsu Ushaka continued south a few hours in order to reach Tupac Yupanqui. 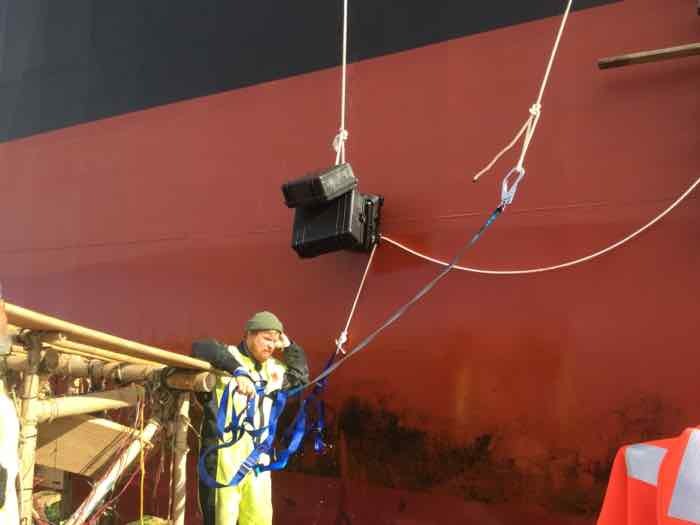 Captain Ola and captain Signe, both needless to say concerned over the situation, were deeply impressed by how perfectly the captain maneuvered the 49 000 tonne and 210 meter long ship so close to the raft that the crew could throw mooring lines down to the rafts. This ship is as long as a skyscraper is high and has only one propeller - maneuvering is not easy. The huge hull of Hokuetsu Ushaka served to dampen the waves as the assisted raft was tied longside. A rope ladder was lowered down along the ship side and the raft crew, each secured with a harness, climbed up the 16 meter high ship side. Equipment was hoisted up in another rope that was manned by the dedicated crew that worked hard to save as much as possible. All procedures were followed and it was a very successful rescue operation - twice! We would like to commend the captain and crew for the professional and friendly way in which we have been received onboard the ship. (2016-03-18) All Kon-Tiki2 crew members are now safely onboard the Hokuetsu Ushaka freight ship. 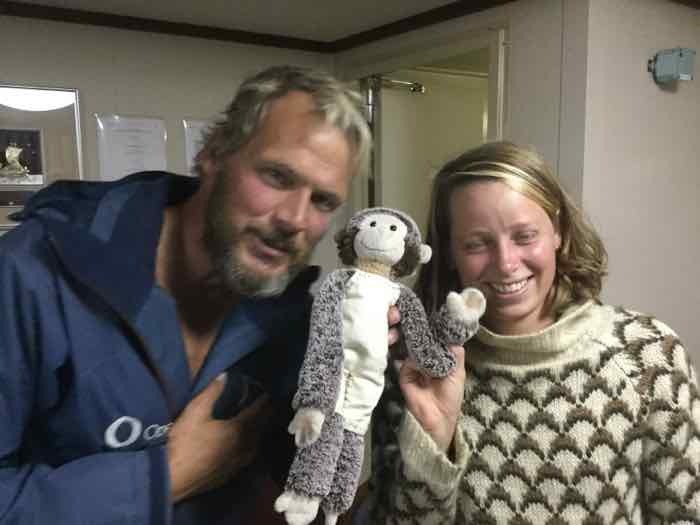 This includes Balsa, our monkey mascot, as seen with Expedition leader Torgeir Higraff and Captain Signe Meling in the last picture. The expedition requested assistance after 114 days and 4500 nautical miles in the South-East Pacific. 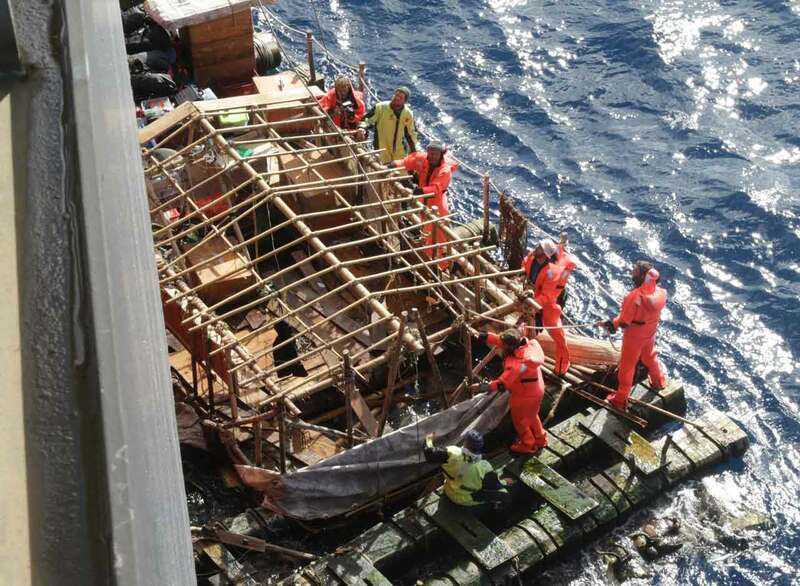 The balsa rafts were dismantled in a controlled fashion to not be a danger to other vessels. 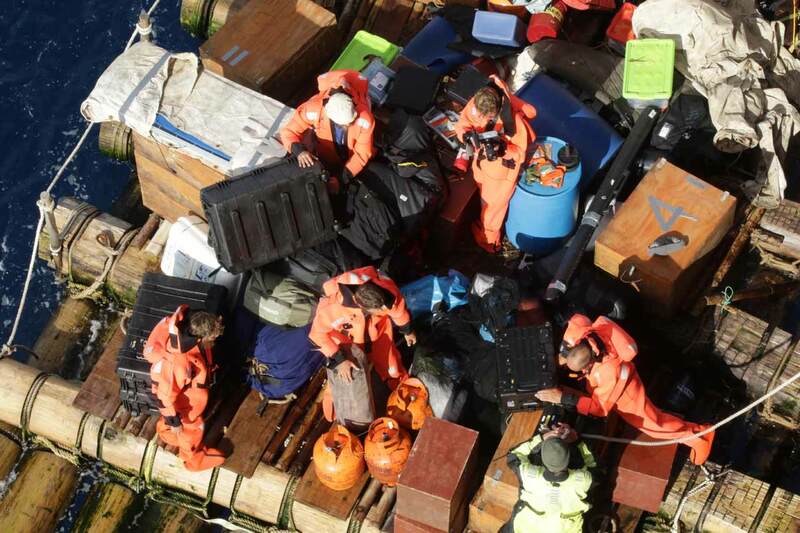 People and equipment were transferred from the raft to the freight ship, and Captain Ola Borgfjord can be seen with cases of equipment in the sceond picture. We are thankful to the captain and crew of the Hokuetsu Ushaka for welcoming us. 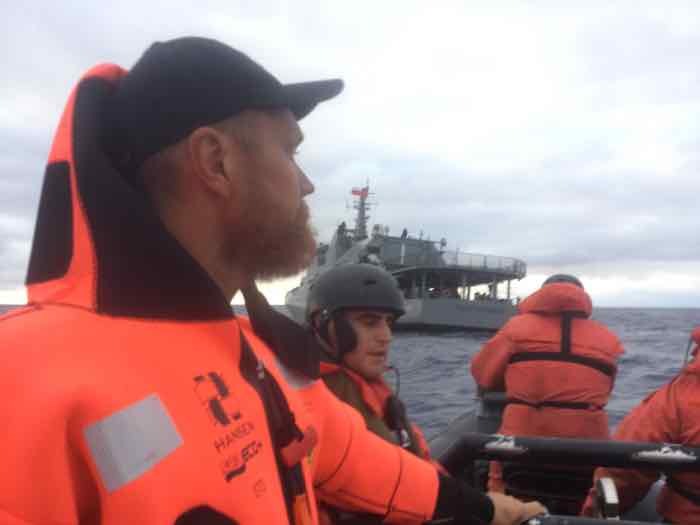 Also, we thank the Chilean Navy for coordinating the operation in a highly professional manner.